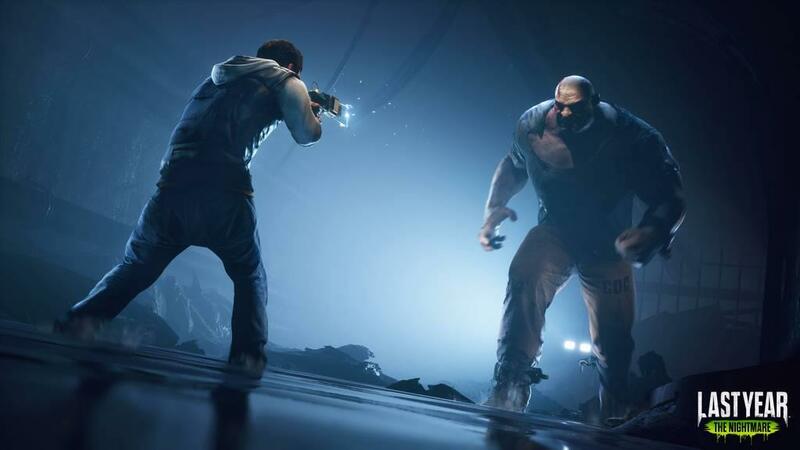 If there is one genre of games that has been on the rise in the past few years, it's the asymmetrical horror game. The genre pits helpless survivors up against merciless, brutal serial killers. Now even though the genre has been on the rise, there have been varied results. Friday the 13th, while an amazing game that perfectly captured the look and feel of the Friday the 13th movies, is unfortunately on life support right now due to rights issues with the franchise. Dead by Daylight is currently the king of the genre that still averages about 12,000 - 15,000 players at a time on Steam. Then there is Last Year: The Nightmare, a new asymmetrical horror game that is currently exclusive on the Discord store. So is this more Friday the 13th or Dead by Daylight? Well it's kind of in the middle. After playing a ton of the game, there is a lot of potential here and it can be really fun at times, but it's clear the game was released early as it's very bare bones. 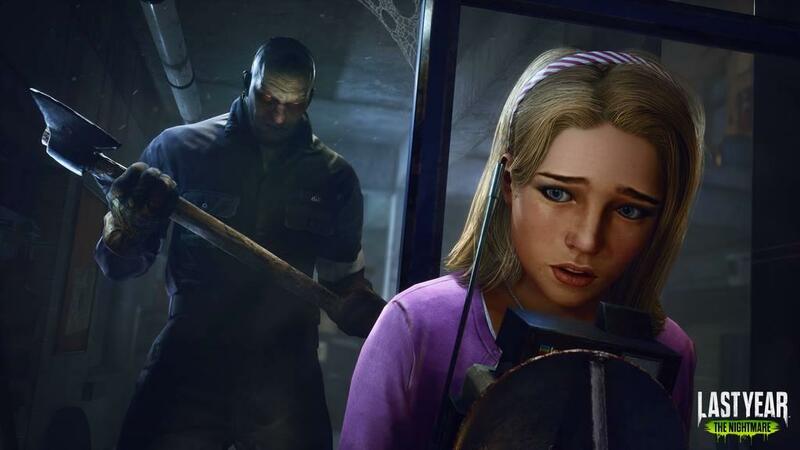 Last Year: The Nightmare finds five Survivors go up against a single Killer with a general theme of 90's horror movies, complete with characters that tick off all of the trope boxes. You have Amber the prom queen mean girl. Nick the nerd, Samantha the dork, and then jocks, Chad and Troy. What makes Last Year different from other asymmetrical horror games is that after picking a character, you pick a class. The four classes are medic, assault, scout and technician. The assault classes can attack the killer, the medic heals teammates, the scout carries a radar that let's everyone know if the Killer is nearby and the technician who can build turrets. Killers also have some tricks up their sleeve as well as they have the ability to lay down traps. Survivors stepping in these traps of course leave them open to attack until another Survivor saves them. They can also be used strategically to slow down survivors on their way to objectives. The game has full voice chatting which is essential to survival as you can discuss with your team what you think the best course of action would be going forward including what classes would be best. Classes can be swapped after you die and up to two people can pick a single class so if you wanted to you could have two assaults, two medics and one scout. Personally I love playing as the Scout who uses a radar and can tell when the Killer is nearby. If the radar is blue, it means they hasn't spawned in yet but you can tell if they are nearby. When it turns green, it means that the Killer is nearby. The Scout also can flash the Killer blinding them for a few seconds allowing the Survivors to try and get away. All of the classes are fun to play so you never have an issue where you are essentially forced to play as the class you don't want. You can also upgrade your class weapons through scrap. Scrap can be found throughout each map but you need to be mindful of it as it's in short supply and only the person that picks it up gets it. If you hoard all the scrap then your teammates won't be able to upgrade their weapons and if you die, you just screwed over the team because that means that all that scrap you hoarded was for nothing. Personally I feel like the scrap system could use an overhaul. 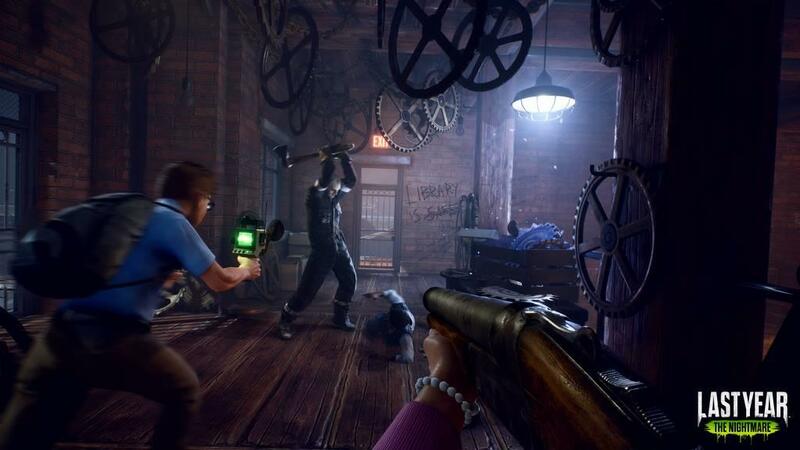 With five players looking for as much scrap as possible, there are times when late in the game you are desperate to find scrap to upgrade your weapons, but this is the point where you are about to make an escape and the Killer is aggressively trying to get kills. There are three maps currently in the game. The Gym, the Bell Tower and The Library. 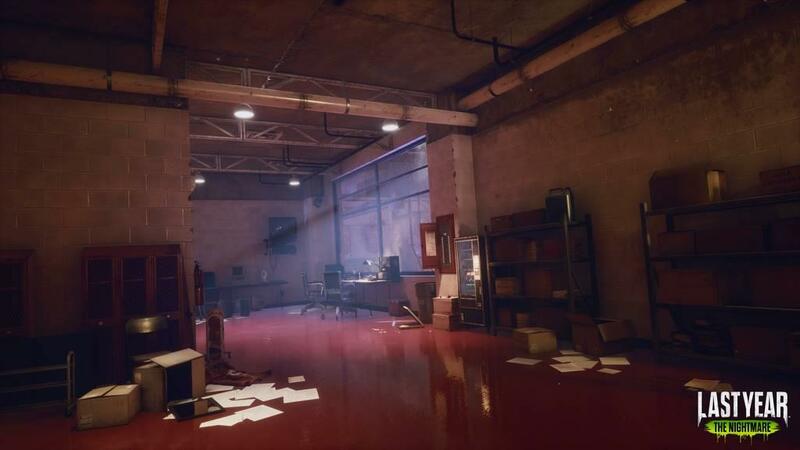 Each map has various objectives that need to be complete in order for the group to escape. 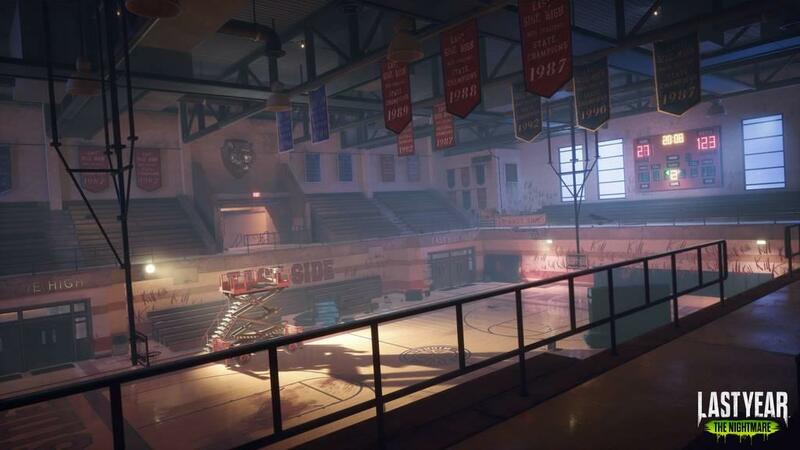 In the Gym, you need to find two gas tanks, power up the lift, ride the lift to the other side of the gym and then escape via the rafters. Everyone is also on a timer. When the timer runs out, the match ends and all remaining Survivors are considered "killed". 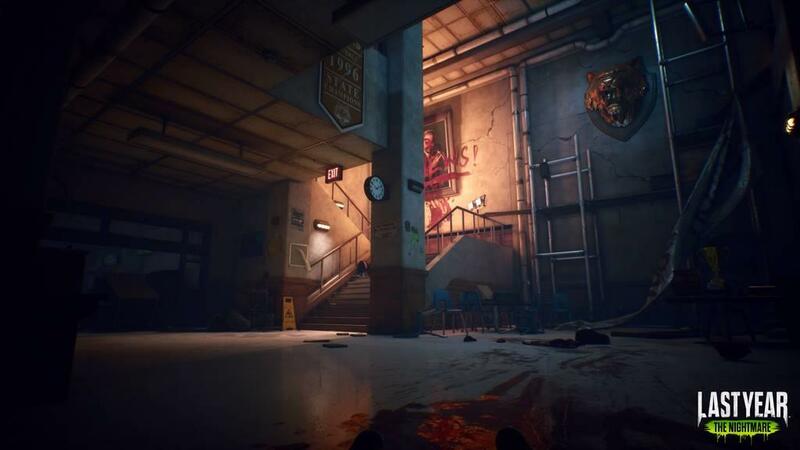 This is where Last Year shines because having objectives to complete, even though they are the same every game help break up the monotony of other Horror games where you may only have a single objective to complete and the final escape where the exit gates are opened and you only have 60 seconds or so to exit leads to a lot of intense moments. There were so many games where a teammate would sacrifice themselves by throwing themselves at a Killer or times where you are about to escape only to get knocked off the narrow path to the exit leading to a lot of "JUST GO, SAVE YOURSELF, LEAVE ME BEHIND" yelling and screaming over the mic. Another major difference from other games in the genre is that Survivors can respawn after being killed. If you are killed, you will then respawn in a locked room, much like Left 4 Dead and the other characters will have to come get you. The Killer can also respawn after being Killed. There are three separate Killers to choose from. The Slasher who is the "go to" Killer. He can slash teammates with an axe and can kill them in a few hits. Strangler has very low health but is good at separating teammates. You can hook Survivors and then pull them towards you. This can lead to some hilarious moment where you can pull a Survivor up on a high ledge to their death. The Giant is incredibly slow and has high health, but hits like a truck. 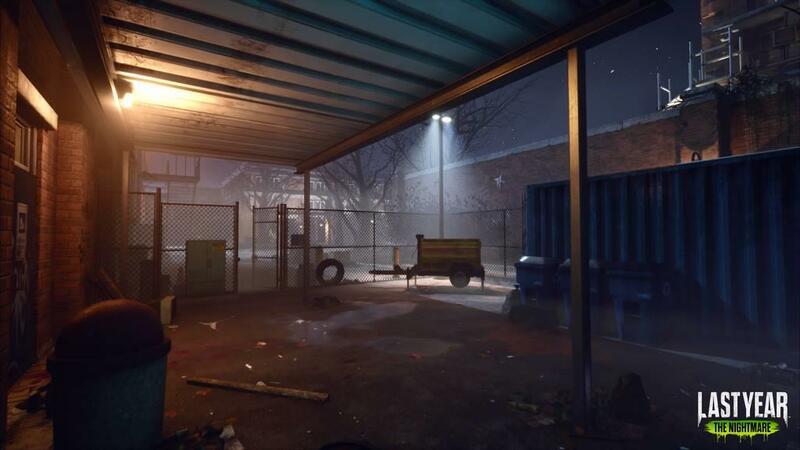 If there is one thing this game gets right, is making you feel like you are in a horror movie. Like Friday the 13th, the Killer has the ability to pretty much appear at any time as the Killer can teleport and speed around the map while not spawned in. As long as the Killer is not in the line of sight of any Survivors, they can spawn. This leads to tons of moments where the Killer will literally appear right around a corner or behind a door and will strike instantly. There are also spots on each of the maps which provide opportunity for Killers to perform instant Kills. The Slasher can hide in Skylights and then pounce on a Survivor if they walk under the skylight. The Strangler can hide in vents and then pull Survivors in to their doom. Finally, the Giant can hide in walls and if a Survivor walks near it can burst out of the wall and kill them instantly. Playing the game with teammates on a mic leads to a lot of yelling and screaming when the killer starts to show up or when someone gets insta-killed. Let me tell you, hearing everyone yell on the mic in horror as we watch a teammate get pulled into a vent will never get old. Where Last Year starts to fall apart is the fact that while fun at times, it's incredibly shallow and feels like a very early access title. As of this writing, there has only been a single update to the game, which hardly fixed anything but there are still massive issues with balance and glitches. Against a well coordinated team, the Killer stands absolutely no chance and the Survivors will stomp them every time. Items you can craft like the Taser are incredibly over powered and completely stops a Killer in their tracks while the assault classes just beat them to death. 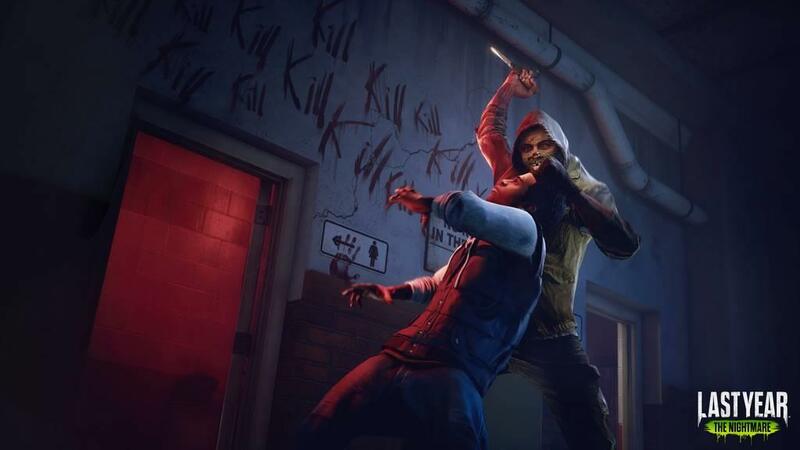 While new updates and Killers in the future as of now the Killers feel very under powered as Survivors pretty much know all of the ways to coordinate and avoid getting killed. There is also the issue of the game feeling very buggy. I had multiple games where Killers or Survivors would get stuck in walls or fall through the floor. Finally, there is absolutely no progression system in the game at all so after a while, the game gets boring because you aren't working towards anything. There are no unlockable costumes, no XP or leveling system, no perks or skills to unlock. While this is something that the developers plan to add in the future, unfortunately, I can only review what I have right now. Last Year shows a lot of promise and there were times when I was having a blast, but after a while the fun really starts to wear off because you will essentially see and do everything there is to do in a couple of hours. 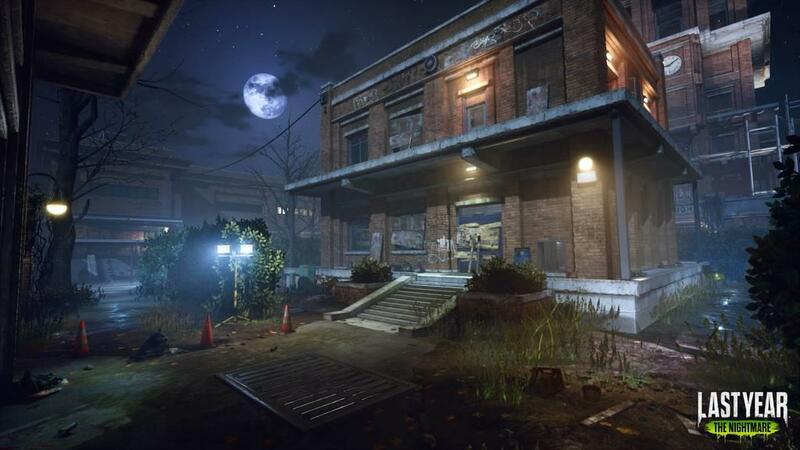 I love the idea of the game, the characters, the 90's theme, the maps and the Killers but it's just a shame that as of now, there really isn't anything to work towards. The game feels like a demo and while the developers have announced free DLC and support for the game throughout 2019, it still makes me wish there were more to do or a leveling system to keep me playing.